The Renaissance of Exercise – Volume II by Ken Hutchins. Potentially, as we noted in Part I, the best overall exercise is a leg press. A leg press is a compound movement or multiple-joint movement or linear movement. All of these terms mean much the same thing. And the physical therapists introduced a fourth term several decades ago—closed-chain. And potentially, the most geometrically perfect exercise is a knee extension. A knee extension is a simple movement or single-joint movement or rotary-form movement. The term now used by the supposedly enlightened is open-chain. When referring to simple movements, I am particularly toward the usage of “rotary-form.” Note that I do not use “rotary movement” or “rotational movement.” These terms might suffice, but I avoid them because of distinctions I noticed during 1983-1985. Since then only “rotary form” rings true to my ears. I will try to explain. Perhaps I can justify my linguistic bias. Arthur liked the term, “rotary resistance.” As I alluded in Part I and in other writings, “rotary resistance” is part of Arthur’s dupery. In physics, there is no such thing. Of course, we have torque, which is a product of force magnitude and lever length. I can only excuse Arthur’s technical imprecision with “rotary resistance,” since he was trying to communicate with morons who can never understand torque. Nevertheless, he misled thousands of people with his bastardization of physics. Rotary Resistance was the first and most important requirement in Arthur’s faulty Ten Requirements of Full-Range Exercise. Any rotary-form exercise might qualify as full-range, but no compound movement was eligible, first of all, because it was linear-form. So… rotary resistance is a non-starter. And the terms, rotary movement and rotational movement (also rotatory movement) imply that movement—although perhaps desirable— is necessary for exercise and it is not. Rotary-form (or rotational format, with additional and unnecessary syllables) says more about the nature of the joint—whether is it is moving or static. Hence, I stick with this term. Another distinction: In Arthur’s words, the Nautilus Pullover “provides rotary resistance.” In addition to my criticisms of “rotary resistance,” I also focus on “provides.” Whether Arthur knew it or not—and I’m certain he did not—“provides” was a limiting factor of the device. The Nautilus Pullover did not cause, impose, require, make, produce, or create a resistance on a rotational format. The joint—axle—of the machine forces the machine to rotate on its singular movement-arm axis, but it does not force the subject’s arms to rotate on the machine’s axes. The rotational behavior of the subject’s upper arm(s) was caused by the joint itself. Due to its internal geometry as well as the ligaments, capsule, and muscular systems about it, the joint requires rotation to occur if movement is to occur. No external device did this, regardless of the nature of the device—at least not until the advent of the coupled movement arm. And the coupled movement arm was never incorporated into the Pullover. I will explain the coupled movement arm and its effect on a joint later in Part IV, but first we must appreciate the reactionary forces of the more-common, non-coupled movement arm. Note the following photographic series of a prototype Nautilus Pullover. This machine was the first of its kind to place the workbox and weight stack on one side of the machine. I believe that this machine was the basis for the Series III Nautilus equipment line. Also note that this prototype fit women much better to their shoulder and upper arm dimensions than the production Women’s Pullover. I measured all of the various versions of Pullover back then and no one seemed concerned about this. Although when in practical use, the right side of its axle required support, we removed this part of the frame so that observation of the body was less obstructed. In this way Brenda Hutchins and I performed this photographic analysis in 1984. For convenience of discussion, denote instant actionary force as the force produced on the elbow pads by the subject (subject force) and denote instant reactionary force as the force pushing directly on the elbows by the machine (machine force). Instant indirect reactionary force is the force generated by the machine across a fulcrum that changes its effective direction. 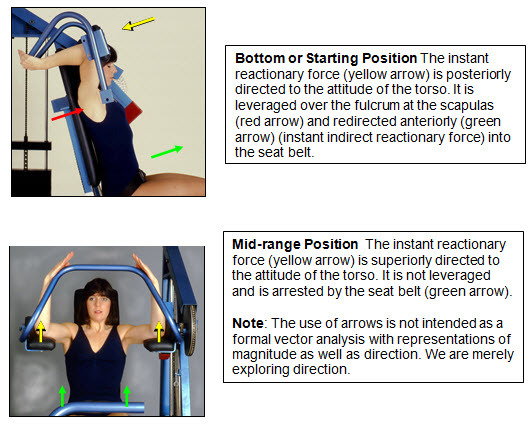 Instant indicates that the force occurs in this direction in only this position of the shoulders and machine. Note that the subject is challenged throughout the pullover motion to control continually changing reactionary force. In some ways and in some exercises we might deem this as a good attribute, but it can lead to problems. 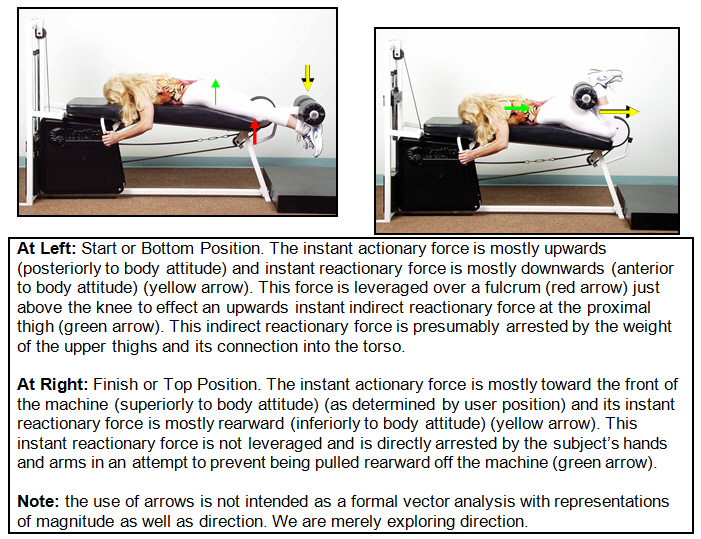 Now apply this appreciation of changing reactionary force in the Pullover to a prone knee flexion exercise. As we approached the 1980s, the above photographic analysis had not been performed. I never heard Arthur or anyone around him explain these details. They seemed important to me. No one else seemed to care. But to a certain degree, some appreciation had to be present. After all, there were, indeed, seat belts on the Nautilus Pullover and handles on the Nautilus Leg Curl. The same reactionary-force analysis can and should be performed upon all the other rotary-form exercise approaches—be they Nautilus, devices from other exercise equipment companies or merely manually applied. Nevertheless, I was then to be jointed into a much deeper understanding of joint mechanics during exercise—especially exercise for the knee. And this vista of new information would not arise from a sophisticated source, but from some low brows stretching to create science from crap. I credit (or rather discredit) Frank Noyes, MD as the progenitor of the misinformation regarding shear forces about the knee. I’m confident about this, but not 100%. If I am incorrect in my blame, I apologize to Noyes and his team, however, I have written about this for many years and have not heard a peep of correction or retraction or debate. Bad Influences From Research In the 1980s the new enlightenment regarding knee rehab was all the rage about so-called shear forces. Would-be experts talked as though this is something special and dangerous and something to be avoided. They made a big deal about it especially as it regards the knee and especially the cruciate ligaments of the knee. And this culminated in a blanket condemnation of the knee extension exercise. This was all smartly reasoned by people who were probably immersed in highly ballistic isokinetics philosophy (“measuring forces at normal training speeds’), who gathered data from a dead human limb that was incapable of representing the dynamic synergism of a live limb. This farcical research model was then exploded to stratospheric comedic heights by people who did not know how to properly design, build, or apply and use a knee extension machine. Shear forces are indeed a reality, and they are ubiquitous. And they do not present special concerns for the knee in most normal and rehabilitative situations. Some of these seem to dismiss or minimize concern that shear is more meaningful with knee extension than with compound movement. I believe that—regardless of the interpretations—much has been overlooked. Also, such studies almost always present hedged conclusions. If a rock-solid conclusion regarding a topic was, indeed, ever appropriate, making such a bold statement seemingly closes the door for more grant money for more research. Nevertheless, research on a live limb does not necessarily demonstrate reality when the musculatures are artificially and selectively stimulated. Multiple Overlooked Concerns I am one of the few people who is aware of the exact resistance curves portrayed by the knee extension equipment that was provided by Nautilus, Cybex, and MedX in the past 30 years. And—regardless of these curves—I know that almost everyone else so armed with this information during those years was (and still is) extremely insensitive to the several other requirements—most importantly, movement speed—to effect a reasonably safe and productive exercise stimulus. These several other requirements include an awareness and provision for muscular sufficiency, a correct resistance curve, a minimization of friction, the containment of reactionary forces, and the application of a detailed protocol for transitioning from the positive excursion to the negative and then back again. I demand all of these requirements, though I am certain they are overlooked or unappreciated or dismissed by the usual suspects. Is not it interesting, if not ironic, that some of the same voices that are insensitive to the these requirements of proper knee extension exercise design and application are also the same voices that criticize that I am too detailed and careful, although they condemn the performance of loaded knee extension? Sorry, it can’t be both ways. Back to the Physics As already mentioned several times, there are only two basic kinds of movement in the universe—translation and rotation. And it is exceedingly rare to not have a mixture of these formats in any movement. Movement often incorporates a preponderance of one format over the other, but both are often present. Only in the convenience of conversational or discursive prose can we pretend or presume that one is present to the absolute exclusion of the other. In a sense, all forces about a limb have a shear component. As in a pullover exercise, imagine shoulder extension being produced by the latissimus dorsi. As the muscle contracts, thereby pulling the humerus inferiorly, why is there rotation at the shoulder joint?… Because the joint ligaments and capsule prevent inferior translation of the proximal end of the humerus. Thus inferior shear is arrested by superior shear containment forces or shear control of the ligaments, capsule, synovial lubricity, etc. As regards a joint—and without getting into arcane engineering discussion—shear is nothing more than the translational movement of a body part that we wish to instead stay in place and rotate. And shear force is any force tending towards this undesirable behavior. In short, shear is undesirable translation. At least, this is the case in this application. Sometimes the shear controls—ligaments, capsule, etc.—are external. This is what we observe with the shoulder for the most part. And sometimes the shear controls are internal. A great example of internal shear controls is the cruciate ligaments of the human knee. Imagine the flaps on a model airplane. They are often attached by crisscrossed strips of woven fabric. This arrangement effects a hinge. In a sense, this is what the cruciate ligaments do on the inside of the human knee. Closed-Chain Movement such as the Leg Press gained popularity simultaneously with the underserved hysteria that emerged in the 1980s regarding shear forces. 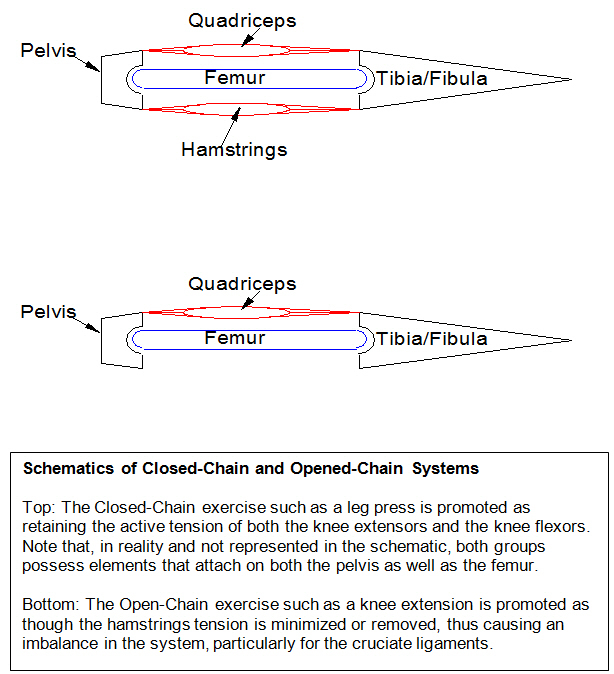 Closed-Chain refers to the concurrent contraction performed in a leg press by the knee flexors (hamstrings) and the knee extensors (quadriceps). The reasoning—not completely incorrect—is that the combination of forces from both musculatures during knee extension as performed on leg press is more balanced and protective to the cruciates than when performing a knee extension exercise. A knee extension exercise is characterized as being open-chain, because the hamstrings are believed to be unloaded and non-contributive. The complete loop from the ischium through the hamstrings, to the hamstrings insertions on the tibia and fibula, through those two bones and their ligamentous attachments, to and though the patellar tendon, through the patella, through the quadriceps tendon, through the quadriceps (especially the rectus femoris), to the iliac crest, and back through the pelvis to the ischium again is said to be open. Therefore, as the story goes, it is further reasoned that the knee receives contractile force from the quadriceps alone and that the exclusion of the hamstrings counterforce greatly threatens the cruciate ligaments and thus knee stability. This fear of the supposed shear forces inherent in a knee extension exercise was greatly overstated, but is widely accepted today. For instance, I recently read a prescription from a physical medicine specialist stating the need for “closed-chain exercises.” And this provision is sometimes stated for the elbow and other joints as well although the elbow does not function near as loosely as the knee. The antagonist of either agonist provides little stability to the elbow when compared to the knee. What is of questionable concern for the knee is far more remotely a concern for the elbow. The promotion of closed-chain exercise—particularly for the knee—appears correct in theory, but it doesn’t pan out with a viable human knee in almost all cases. Nevertheless, good judgment is required and good judgment is impossible without clarifying information that is not widely available to the medical community. First: What Are the Comparative Forces? In various situations, it may well be that the shear talkers are correct to be concerned with compromised cruciates, especially those that have been surgically repaired or replaced by such procedures as Slocum, etc. But where is the line? How do we know that force magnitude on the cruciates and its source and situational conditions effecting it? We don’t. And this was certainly not quantified with dead limbs and begs too many other questions with artificially stimulated live ones. This is asinine. Second: The Hamstrings Are Never Completely A.W.O.L. 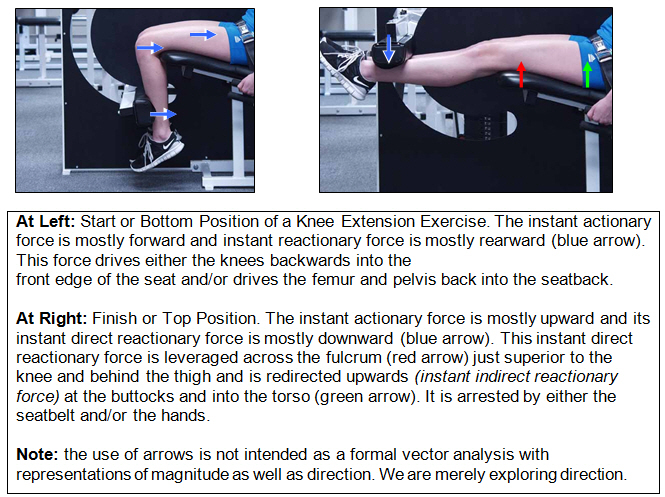 And the assumption that the hamstrings ineffectively contain shear during a knee extension exercise is questionable from another perspective. As the knee progressively extends, the hamstrings are progressively lengthened, thus growing closer to passive insuffiency (depending on hip flexion angle). And then, if the subject sits on the hamstrings during active extension, this counterforce looms greater. Note that, in practice at RenEx, we procedurally comb down the flesh on the posterior-distal thigh before sitting firmly for knee extension exercise. We do this to avoid the annoying tension and hair pulling that occurs as this material is stretched as the knees straighten. Although, this procedure is superficial and has little-to-no effect on the hamstrings, it does raise our attention to the fact that the hamstrings impart parallelogram force to its insertions as this contact area is squeezed due to the subject’s weight and counterforce from the movement arm. Although they are indeed unloaded, the hamstrings still render force to the knee. Third: What About Knee Setting?? There is a huge inconsistency here. Do we not see so-called knee setting exercise ordered and performed immediately after surgery?… In bed before ambulation?… Perhaps in the recovery room? Is this not SOP for cruciate repairs and most other knee surgery except for some patellar fractures or quadriceps/patellar tendon repairs? And this knee setting is exactly what the anti-leg extension shear talkers are condemning, except in this case it is exactly when the cruciate repair is most vulnerable. And who knows the force exerted by the patient or his relative effort? Does the patient inadvertently extend the knee harder with the quadriceps because he can’t flex his hip with part of the same muscle? This is too complex to precisely control. I do reserve that this might be contraindicated after cruciate repair, but if it is not, we are observing widespread practice early post-operatively of exactly what the shear talkers warned about with a knee extension exercise. Specialists also inform me that knee setting is not concerning as one might think since the repairs are now so very secure. So why would performing a knee extension exercise, per se, still cause concern? After all, the forces—a la shifted transposition—are far more controllable in a properly designed knee extension machine than with knee setting. Fourth: Resistance Curves And there are other forces to consider. Arthur Jones noted that to truly analyze the danger to the body we must know the exact force magnitude required to cause damage—exceeding the structural integrity of the body—as well as the exact force magnitude encountered by the body. If the latter exceeds the first, then damage occurs. And we rarely, if ever, know either of these two factors in any event. One source of force that is, indeed, knowable is the load levered on the leg from the exercise machine—the knee extension machine specifically. In general, this is not known by a knee specialist or anyone else for that matter. In Part III, I will present a collection of resistance curves. These curves are used to identify the most offending loads provided by various equipment designs during the last 30 degrees of knee extension. These are contrasted against the ideal as displayed by the original SuperSlow® Systems machines as well as the new RenEx curve. Awesome!!! A first time ever client hired me today, she’s in her 50’s and has had 3 knee surgeries. Perfect timing. This will help me, thanks guys! Thanks for taking the time to write this series of articles. Truly a fascinating read! I’m going to have to go back and reread through this. Your experience and attention to details is very apparent. I always look forward to the articles on this site as well as the comments. Ortho docs start w/ quad setting immediately after ACL repair too. Where is the biomechanics expert??? Sorry, hit the space bar too soon. I was excited. Thanks for this in-depth overview and analysis, which for me is particularly useful right at a time where I’ve been challenged with properly configuring a SS Pullover for smaller women. No wonder. Looking forward to Part III ! elbow to elbow is _three inches difference. That might make a difference to a woman, whether she feels comfortable in it or not, meaning whether or not she’s actually going to like using it. no matter what it is, offer something no one else does……….. Yes, and the largest (anatomically) Pullover of all was the low-profile Plateloading Pullover–a machine often purchased for use by physically immature high-school students. Of course, there were several different versions of this machine over the years. fascinating woman who Arthur considered hiring to run his video studios. was with the visitors and positioned herself directly in front of me. I acknowledged her precision, and she scampered back to the office. I have often heard people talk about open-chain and closed chain exercises talking as someone with high authority. Even though I have often heard and read about closed and open chained exercises you are the first person that has explained exactly what is meant by open and closed chain exercises. I am sure that many people who talk about open and closed chain exercises don’t really know what they are talking about and are just repeating the same jargon as the so-called experts. Only in the fitness industry could we have people gathering data from dead human knee and people making some informed scientific fact from that information. I suppose we sit a lot and we have to stand from sitting, that would be mean that we go from open chain to closed chain movements. I am not sure about the word chain to me chains have links and can be very flexible in movement when loose, muscles have attachment points to bones that can very rigid nothing like a chain. There is a saying that, “A chain is only as strong as it weakest link” if you know how much force is required to break the chain. We could calculate the breaking strain of the chain, but a calcualtion a lot harder on a human. Great article, thanks for the detailed information. @ Ken or Josh . For timed static contraction exercise with leg extensions at what position do you recommend that the leg be fixed? Couple things to add. Saw reference to a leg extension in a book a while back, talking about its dangers. It showed the ankle moving backwards and the knee moving forwards. The thing is, the knee is a Class 3 lever. Class 1 has the fulcrum in between the load and effort. One goes up while the other goes down. One goes left, the other goes right. Class 2 and 3 levers have the fulcrum at one end. The load and effort always move in the same direction. If the knee is going forward while the ankle moves backward, then the fulcrum has to be in between, yet the fulcrum is the joint, which is at the top. The problem occurs because the machine is ill-designed, and the seat’s front edge is fouling on the back of the calf, preventing backward movement, and shifting the fulcrum from the knee joint to the contact point between the seat edge and calf. Once contact is made, continued movement results in the knee joint being pried apart. The seat edge should be far enough back to prevent this. The fouling aspect is related to some of the info put forth about the design reasoning behind the Duo-Squat, when Darden commented about the calf coming back and hitting the hamstring, and changing its fulcrum. It’s detailed in the Nautilus Advanced Bodybuilding Book. The other thing is, the shear forces can’t get very high, because the muscles end up kicking in to support the load. It would be a significant problem if the knee musculatures were to remain relaxed AND we also apply shear force. It’s similar to trying to stretch a tendon. In order to do so, you’d have to get the load high enough AND keep the muscle from elongating. Can’t be done. The muscle will always give first. If not, then muscular strength could get high enough that when trying to move a load, the muscle would shorten, the tendon would stretch, and the load would remain stationary.